The Select Partition screen applies only if you are installing from a disk partition (that is, if you used the askmethod boot options and selected Hard Drive in the Installation Method dialog). 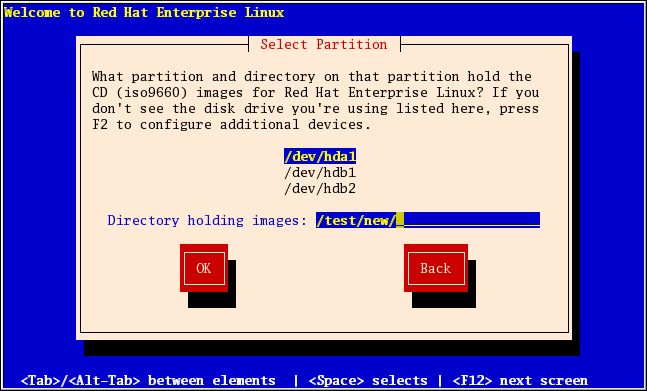 This dialog allows you to name the disk partition and directory from which you are installing Red Hat Enterprise Linux. If you used the repo=hd boot option, you already specified a partition. Enter the device name of the partition containing the Red Hat Enterprise Linux ISO images. This partition must be formatted with a ext2 or vfat filesystem, and cannot be a logical volume. There is also a field labeled Directory holding images. If the ISO images are in the root (top-level) directory of a partition, enter a /. If the ISO images are located in a subdirectory of a mounted partition, enter the name of the directory holding the ISO images within that partition. For example, if the partition on which the ISO images is normally mounted as /home/, and the images are in /home/new/, you would enter /new/. After you have identified the disk partition, the Welcome dialog appears.